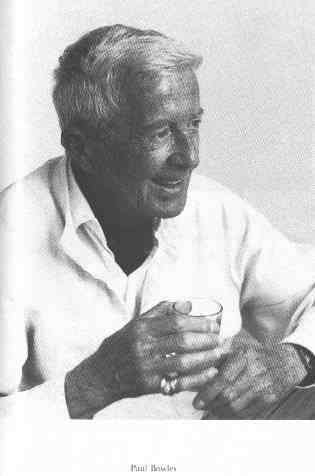 Paul Bowles Interview with Bruce Duffie . . . . . It is not often that a successful composer turns to another creative profession and wins even more world-wide fame while continuing his music. 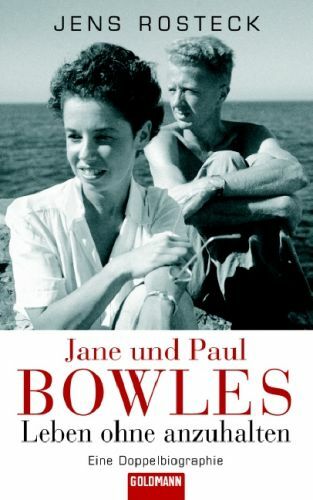 It is our good fortune that Paul Bowles did just that and lived long enough to see a resurgence of interest in his melodic work. 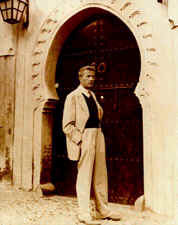 He was born on December 30, 1910 in Queens, New York, traveled to places both familiar and exotic, and spent 52 years in Tangier, Morocco, where he died on November 18. 1999. 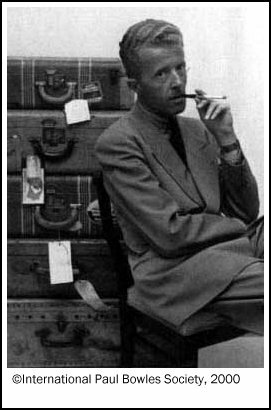 For a biography, photos, audio clips, catalogues, links and other materials by and about Paul Bowles, visit the Official Paul Bowles Website . 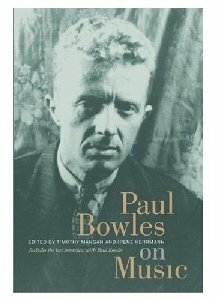 In May of 1992, I had the rare privilege of speaking by telephone with Paul Bowles. 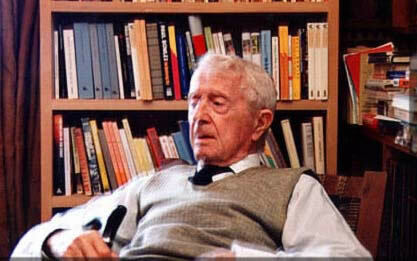 I had met (and interviewed) his close friend Phillip Ramey previously in Chicago, and had asked about Bowles. Ramey said he would be in Tangier in the near future and would arrange to have Bowles speak with me. So a time was set, and I made the call. Even at that late date, the phone connections to this remote location were iffy at best, and Phil warned me about it. As the conversation progressed, there were a few times when one of us would wait a bit longer than usual and realize the other was not being heard. But the missing bits were simply repeated and we were able to communicate well, and nothing seemed to be lost. He chose his words carefully, emphasized the thoughts he wanted to bring out, and laughed abundantly throughout our chat. Though I've tidied it up just a bit, here is most of what went on that day as we 'met' across the world at a distance of 4260 miles . . . . .
PR: Yeah! Is this Bruce Duffie? BD: Bruce Duffie in Chicago, yes. PR: Well, I have him here. BD: Oh, how wonderful. Thank you. BD: Thank you so much. PR: [Puts down receiver and calls out] Paul! [After a few moments] Here he is, Bruce. BD: This is Bruce Duffie in Chicago. BD: Good morning, how are you? PB: Oh, fine. Just having a cup of coffee. BD: Ah. Good, good. Now is a good time for our conversation? PB: Well, I hope so, yes. BD: Good. I appreciate very much your taking a little time to speak with me. PB: Well, it's a pleasure. BD: Let me begin by asking you about Tangier. You've spent quite a bit of time there. Do you find it a good place to work? PB: [Holds out the word "yes," in a low tone of voice, as if implying that his answer should be obvious to everyone] Yes. If I hadn't, [chuckles] I wouldn't have done anything, because I've been here since 1931. What's that, 61 years? BD: What is special about working there in Tangier? PB: [Laughs, as if surprised to be asked such a question] Well, I don't know. It has changed enormously over the years, but there are an awful lot of people coming to see me every day now, and that isn't so good for work. I always was left alone. It was quiet. Much better than New York. BD: So you prefer the isolation. PB: Oh, of course. Oh, yes. BD: You worked on both music and prose there. Did you find it different to work on those two? PB: Well, of course! [Chuckles] They are different, and they employ different parts of the mind. But when I got tired of one, I would go and do the other, back and forth. BD: So there was a time when you were working both in music and in prose? PB: [Emphatically] Oh, yes. Almost the entire time, because although I didn't go back to the States after...well, the last time I was there was in 1968. I was doing theater music here, for the dramatic productions of the American School [of Tangier], which were just as taxing, if not more so, as the ones back on Broadway. BD: [Chuckles] You didn't find, being remote and far away from Broadway, that you couldn't compose for Broadway? PB: No, no! It had nothing to do with it. I often wrote the scores here, and went back to New York and rehearsed them for the play. But, as I say, I've been doing scores for the dramatic productions of the American School here. They have a fancy dramatic department, and they put on rather taxing plays. Generally in Greek...I mean the old Greeks. The one they're doing this year is from Euripides, but it will be all in Arabic. What it'll sound like I don't know, but it will be fun. Yves Saint-Laurent is doing the costumes, and that will help, you know, visually. BD: Being there in Tangier, are you able to keep up with and hear music by various new composers? PB: No. [Chuckles] I'm rather cut off from contemporary aesthetics. That isolates one, but I don't care. I should, I suppose, but I'm cut off from many things. Right now there are no films, except those made in Hong Kong. That's all anyone here wants. There's no cultural life whatever. That's a help. BD: It really is a help to be cut off from this? PB: You have to supply your own culture. [Chuckles] There isn't any around here. BD: [Laughs] So all the ideas come from you? PB: That's right, yes. Well, one imagines that all ideas come from oneself, but I doubt that they do, because everything one does is a matter of memory. Subconscious. I mean I don't think there's much invention possible. BD: So it's continuation and adaptation rather than invention. PB: I think always, yes. In other words, there's nothing new under the sun. It really comes from one's past experience. Obviously; what else could it come from? BD: What did you learn from Nadia Boulanger? PB: I learned nothing, because I didn't study with her. People say I did, but I say I didn't. I enrolled in her class at the École Normale [de Musique de Paris]. That was counterpoint, but I didn't stay. I was much too eager to get to Spain. And that's what I did. I suppose I passed up a good chance to learn something, but I didn't do it. I didn't study with her. BD: Well, concerning your music, who do you feel was the greatest influence on your style? BD: Well, they don't come too much better than that. Do you feel you are part of a lineage of composers? PB: No, no. I never felt that, really. [Thinks for a moment] I'm American, so I suppose I'd be considered perhaps part of American music. But since the greater part of my music writing time was devoted to writing music for the theater in New York, I didn't have too much time to write my own music. And it's important to write one's own music, obviously, rather than music to please a director, or even a producer. Sometimes one had to please the person producing the show. 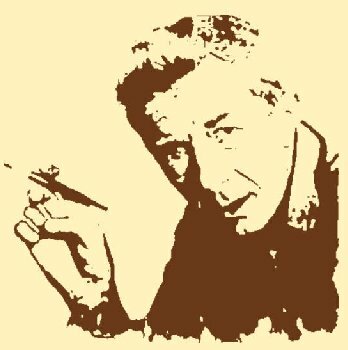 BD: Are there any pieces of yours which you could consider your own music? PB: Oh, yes, plenty. Yes, yes. But I would've had more if I had been writing my own music from the beginning. But still, I had to earn a living, and that worked very well, until the year I suddenly threw it all up and came here. I'd been here, of course, earlier, in the '30s. [Bowles first arrived in Tangier in August 1931, with Aaron Copland.] In '47 I came back to stay. BD: Are you pleased that there now seems to be a resurgence in the interest of your music? PB: Oh, of course! Naturally. Yeah, oh, yes. [Chuckles] It's not a violent resurgence at all, but people are interested, and they do play it occasionally. Of course, I'm very pleased. BD: Have you been basically pleased with the performances and the recordings you've heard of your pieces? PB: [Thinks for a moment] What was your adverb, "basically"? PB: Well, it's on and off, really. Some yes, and some no. It all depends. Not everyone is an ideal performer, by any means. BD: Well, without mentioning a name, is there any ideal performer of any music? PB: I doubt it. I doubt it. Good as they be, one can always find something to criticize, I suppose. No, I don't suppose... But then, the word "ideal" is perhaps badly chosen. Nothing is ideal. "Ideal" is unattainable. It's like...what? It's like the word "democracy." It's an idea, but it doesn't necessarily...[chuckles]...exist. BD: Well, is the ideal performance something we should strive for? PB: I wouldn't think it's worth spending too much energy trying to have it. No. No, no. What's important is understanding a given piece, and performing it as near as possible to the way the composer apparently wished it. That's more than a great performance; no? BD: Is this the advice that you have for performers, to just make the works understood? PB: Well, first of all, they must understand them themselves. And they don't, always. Their changes are [chuckles] spectacular, sometimes. The tempi markings don't mean anything to them and the dynamics are disregarded because they have their own idea of how it should go, of course. Plenty of conductors claim that Stravinsky didn't know how to conduct his own music, but I don't believe that for a minute. I find his versions are far better than others'. So, I don't know. What one should strive for is understanding, but that means not only intellectual understanding, but a general understanding, emotional understanding, at the same time. BD: Do you expect any kind of interpretation on the part of performers when your songs are sung, or when your piano works are given? PB: Well, one has to expect it and accept it, I suppose, although one doesn't like it. I don't think interpretation is proper, but obviously everyone has his own ideas. BD: I assume, though, that you do not want each performance to be a carbon copy of a "best performance." PB: No, of course not. No. But I do like it when they pay attention to what's written. BD: [Laughs] Do you litter your scores with a lot of suggestions, or do you keep them fairly clean? PB: Oh, practically no suggestions. [chuckles] The main suggestion, generally, at the beginning of each movement or piece is absolutely strict tempo. No ritardandi, you know. I don't like that. Any of the things that apply to 19th century music can be left out. BD: This, of course, is for mostly instrumental music. Does the same apply to songs with texts? PB: [Thinks for a moment] No, I don't think so. I think singers need to be allowed more leeway, especially if they empathize, if they sympathize with the meaning of a text. It will probably be more lyrical if they allow themselves a certain amount of freedom. BD: Tell me the joys and sorrows of writing for the human voice. PB: First of all there must be a good voice. That's the only thing that could give one joy. It doesn't matter how good the interpretation is, or how bad it is. If there's no voice there's nothing. A lot of the people who are willing to perform contemporary music are people who have next to no voice! And that does not provide one with joy, certainly. But that's the principal sorrow. You hear it and you think how good it would sound if the voice were only good. But it isn't. Those who have excellent, fine voices are not interested in contemporary music. They want to sing classics of one sort or another, so they're cut off from what's going on today. BD: Is there anything more that you as the composer can do to get more fine voices interested in singing your pieces? PB: No, I don't think so. Certainly not from Tangier! There is nothing much you can do, living here, except produce whatever you produce, and send it out. But you haven't anything really to say about how it's presented. It's too far away. It's not part of anything, Tangier. People imagine that it's like a continuation of Europe, because it's within sight of Spain, of course. But it's very, very different. BD: But that's what holds the fascination for you. BD: Let me ask the big question: what is the purpose of music? PB: [Chuckles] That is big question, isn't it? I suppose it is to give pleasure, and to give it through a medium which involves the intellect. People imagine that music involves only the emotions, which is extremely false, I think. One has to hear it with one's mind, and only then can one really enjoy it. But I know many contemporary composers feel that the purpose of music is not to give pleasure at all. And I don't know what they think it is, then. BD: But for you it is to give pleasure. PB: That's my feeling, yes! It seems to be the purpose of all art is to give pleasure, to make life more livable. And that includes literature, painting, all the visual arts; and music. All those things are to give pleasure. I suppose even philosophy is meant to give pleasure. PB: If you can explain the mystery of life, you give pleasure to the people to whom it's being explained! But, then, what's the purpose of life? [Pauses, as if waiting for an answer to this rhetorical question] There isn't any, is there? BD: Have you come up with an answer to that question? PB: Well, yes! That's the answer: there is no purpose. BD: You write both music and prose. Do you get the same satisfaction when you're writing a song as when you complete a chapter? PB: [Thinks for a moment, then responds firmly and a bit gruffly] No. The reason for that is that you don't hear it. I mean, you can read over your prose, and you know what you've done. But you don't really know what you've done in music until you hear it. And you can't hear it, obviously, when you write it. And if you're living here, you probably won't ever hear it. Or you may hear it 20 years later, or more. BD: You don't hear the song in your mind's ear? PB: Oh, yes! But that's not the same thing as hearing it physically. No, I don't think it's the same thing. BD: I would think your mind's ear could then create an ideal voice. PB: [Laughs, obviously amused at this prospect] Yes, but then it's all in the imagination. BD: Isn't that where it all comes from, though… the imagination? PB: Yes, yes. It comes from it, but I don't think it exists until it is played, or sung… that is, performed audibly, because one's imagination can play terrible tricks. BD: You mentioned that the music has to go through the head. Does the music not go anywhere near the heart? PB: [Dismissively] No, no, no. No! [chuckles] You're speaking anatomically? BD: No, I was speaking more in terms of emotion, rather than intellect. Where the balance is between those two? PB: One cannot get emotion unless one has understood the music intellectually. Otherwise one is bathing in it. And that's not the way to listen to music, letting it flow over one's head. If you know exactly what's happening at every minute, you will get much more pleasure, or emotion, whatever you want. BD: Well, do you feel that audiences today are prepared to accept your music on that level? PB: [With certitude] No. [Laughs] Certainly not. I don't suppose there's ever been an era when the audiences did. If the audience is made up of the general public, no, no. If it's a strictly musical audience, a very small elite, possibly, yes. But then one doesn't write for those people, really; one writes for the greatest number of people. BD: So you wish your music to speak to everyone. PB: Naturally! Yes. Well, everyone... [Chuckles] That's a big order, but still, it would be ideal, to use that word again. BD: [Chuckles] One last question: is composing fun? PB: [Without hesitation] Yes, yes. For me it is. And perhaps it's as much fun as hearing it later. For one does have to hear it. Yes, it's fun! It's a hard work, of course. I think it's harder work, really, than writing prose. After all, when you're writing prose you don't have to put down ten thousand little notes. All you have to do [chuckles] is a few words. You may have to think harder, but the physical labor of writing music is considerable. [Wistfully] I think that's one reason I gave it up and came here. It takes enormous amounts of time. And it wears one out. BD: But I assume it's satisfying in the end. PB: Of course! If it weren't, one wouldn't do it. Yes, it's satisfying especially when you hear it, and it's well performed. Then it's finished. You've written it, it's been performed, and you've been pleased to hear it. That's all you can ask for. BD: Is there a relief when it's over? BD: What do you want? PB: Oh, well, to feel that I've said what I meant to say, musically, and it can be performed, and still say what I want to say when I wrote it. BD: Good. Well, I certainly appreciate your taking the time this morning to talk with me very, very much. PB: Not at all. Thank you for the phone call. This interview was recorded on May 14, 1992, and portions were used on WNIB (along with pieces of his music) later that year, again in 1995 and in 1999. It was posted on this website in October of 2006. 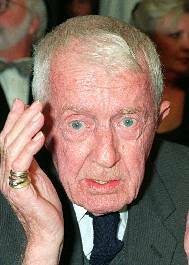 Winner of the ASCAP/Deems Taylor Broadcast Award in 1991, Bruce Duffie spent the years 1975-2001 at WNIB, Classical 97 in Chicago. 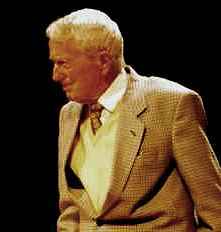 Besides the regular on-air work, he produced regular series devoted to composers, conductors, performers and others involved in Classical Music. Many of his interviews have been published, and after the sale of WNIB in 2001, his work continues to be presented in print, posted on this and other websites, and aired on WNUR-FM, as well as Contemporary Classical Internet Radio. You are invited to visit his website , where you can find links to the interviews which have been posted, and a full list of his guests, as well as other material about his professional and personal life. He also responds to serious E-Mail .